I absolutely adore fresh salmon. It could be grilled, smoked, fried or poached – whichever way it is served I will most likely feel like going back for seconds. Growing up we used to have linner (lunch/dinner just like brunch is a breakfast lunch) at school and one of my favourites was meatballs in a mustard dill sauce. My Mum used to cook a rendition of the dish at home, but since she became pescetarian a little while back she has been serving the sauce with salmon, and I tell you what, it works superbly! The good news is that both the leek and the mustard and dill sauce in this recipe go perfectly well with a slow braised beef fillet or beef cheek too, so if you’re not into fish – and you should be as it’s chockful of goodness like omega3s, you can enjoy the flavours of the sauce with red meat as well. Having said that, Mr Chipconnoisseur and I havd agreed to go vegetarian for 4 days a week. The rest will be a good mix of fresh fish, organic chicken and a little bit of red meat. 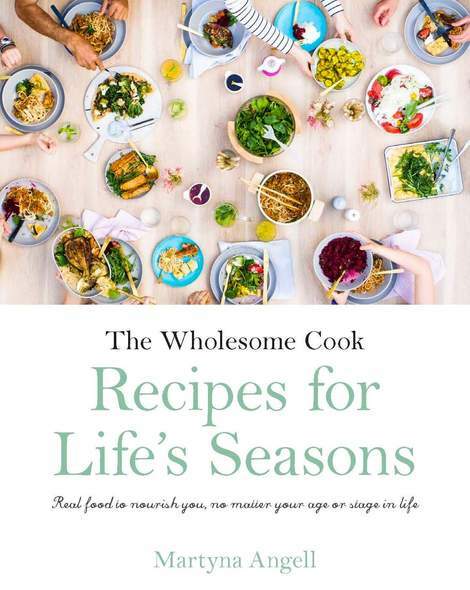 I will obviously continue to share a variety of recipes on the blog but will be attempting to use even more whole ingredients in a lot of my cooking. But before we start, I promise to share a few recipes inspired by our visit to Asia this week. I already have a gorgeous pork belly salad idea and a couple of amazing French soup flavours to try. The sauce and side of leeks go just as well with braised beef cheek or fillet, or any type of white fish. To make the leeks: wash leeks thoroughly. Place in some boiling water and cook for about 10 minutes. Drain and allow to cool slightly. Heat up a little butter in a small pan and add the leeks. Cover and simmer covered for another 20 minutes or until soft. To make the sauce: melt butter in a saucepan, add flour and whisk vigorously, add water and keep whisking until the sauce thickens to cream-like consistency. Add mustard, salt and pepper to taste. Turn off the heat and add chopped dill. To make the salmon: cut fillets in half longways. Slice lemons, place in a pot of water and bring to a boil. Cook salmon in lemon water for about 6-8 minutes if you like it pink in the middle, or 10-12 minutes if you prefer it cooked all the way through. To serve: serve with mash potato or rice with caramelised leeks on the side and a generous helping of the mustard sauce. I love leeks and this looks like a wonderful recipe. 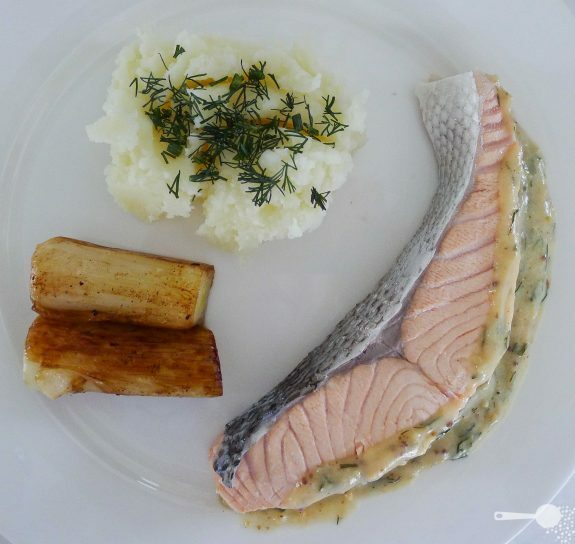 Great idea to pair the sauce with salmon, salmon and dill are great! I often make a yogurt-dill sauce for it. This sounds delicious. Poached salmon is simply fantastic. That mustard dill sauce I imagine is pretty killer with the salmon. Yum!!! And I love leeks too! Salmon and dill marry so beautifully! Totally love dill with fish but never thought of it with beef. We do vegetarian around 4 – 5 days a week and have done for a long time now and wouldn’t change it. Once you know how to mix it up it is easy. Your plate has a smiley face:) I have never made mustard sauce this way, thanks for the idea. That is such a wonderful meal, refreshing and comforting all at once. Oh my god that looks delicious! Except I’d probably roast the salmon, I’m in love with roast salmon. Yum! We eat salmon at least once a week, so I’m happy to have a new recipe to try! I love salmon when it’s done right and from these pictures this looks absolutely perfect! Although I prefer salmon pan-seared coz I love the crispy skin, this dish looks pretty Nordic and delicious! Also love the fact the leek and mustard dill sauce can double up for a nice piece of scotch fillet from the barbie! All the ingredients sound and look perfect together, especially since this salmon doesn’t look like the farmed, super-fat bland version, but rather like wild one (or at least from a “green” farm). I also love mustard and dill sauce (it’s great with vinegared herring). I am impatient to see your Asian discoveries! Thanks for the recipe, looks great! I’ll definitely try the sauce on a variety of meats. I have roasted salmon with a mustard crust, now I will try your sauce. It sounds good. Light, simple, and delicious meal. I love leeks but never caramelized them before – something to look forward to in the near future! Looks delicious!